Lightning Powder 1-4650 Hard Evidence Cyanoacrylate Pouches (100 Pack) FREE SHIPPING! 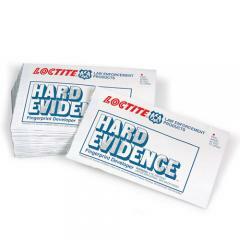 The Hard Evidence® Cyanoacrylate Pouches by Lightning Powder is an economical way to make certain evidence and investigation kits are always fully stocked. Each pouch has a thin layer of cyanoacrylate sealed between two foil halves and are ready to be used at a moment's notice. Simple peel the packet and place it near a heat source to begin fuming. Then place it in, on or near the enclosed object being processed including vehicles, tents, bicycles, bodies and other objects too large for standard chambers. The pouches should be refrigerated when not in use and have a shelf life of approximately six months. Each package contains 100 single-use pouches. ©2002-2019 CopsPlus.com: Lightning Powder 1-4650 Hard Evidence Cyanoacrylate Pouches (100 Pack) FREE SHIPPING!